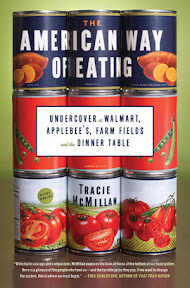 Tracie McMillan, an award-winning journalist, has written in her new book The American Way of Eating: Undercover at Walmart, Applebee's, Farm Fields and the Dinner Table (2011), on the production and consumption of food in the United States is personal and self-deprecating, while also calling on readers to examine how and why the fruits of the earth reach the table. In her book, she takes the reader into the lives of the people who harvest the crops and serve the food that become the grist for America's grinding gears that produce everything from whole grains and fruit, to chicken nuggets and ersatz cheese. Going undercover in 2009, she went to work at the side of American workers to find out how it is that Americans might eater better and cheaper food. McMillan is a native of Michigan, having grown up near the city of Flint - the hometown of General Motors that was once a beacon for American working people. She is no stranger to struggle herself, having worked during her university years to augment a partial tuition scholarship at New York University. Read an excerpt of her book here.